My sister and Michael got married this summer. The wedding took place on my parents property — a beautiful wooded hillside with views for miles. 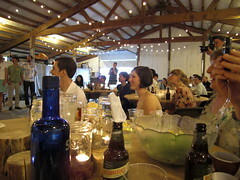 It was a gorgeous day, and everyone had fun, enjoying the wonderful quirkiness of their wedding. Boston terrier Rufus was one of the groomsmen. 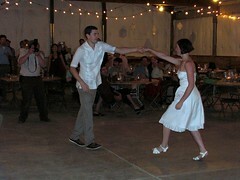 Brittany and Michael played paper rock scissors to decide who said vows first. 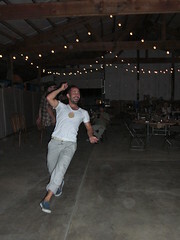 Everyone danced at the barn reception. 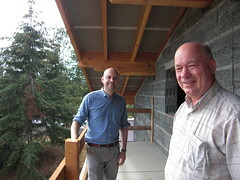 Dad got to show off progress on his Germanic chalet. 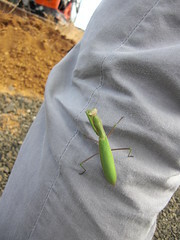 And Dan wore a praying mantis. Jason and I went to Ireland briefly this summer too. 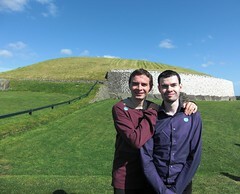 We visited Newgrange, a Stone Age burial and religious site with Adam. 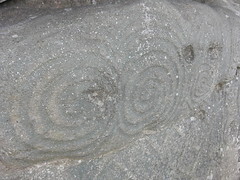 The swirling carvings on parts of the structure were very interesting. 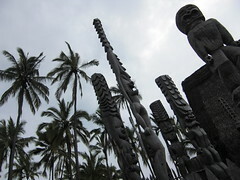 They may symbolize multiple things, including being an abstract map of the local geography. 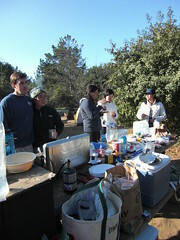 Toward the end of the summer, we camped near Santa Cruz with Lisa and Wai, and several of their friends. With that many foodies, there were lots of tasty things to eat, like Tom Yum chicken skewers, salmon grilled on a flavorful board, and sour plum filled rice balls. Wai showed us where he surfs every weekend too. 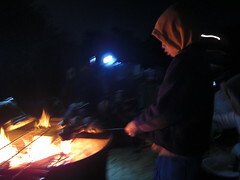 This summer, we went to the Big Island of Hawaii for a week and a half. 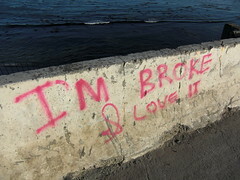 Can't believe I'm blogging about it this late, but here goes. We stayed on the west coast, in Kailua Kona, in a mildewy apartment, with a courtyard suitable for a Filipino inmate new Michael Jackson routine. 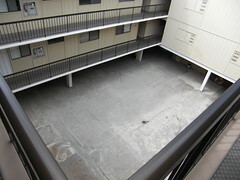 Fortunately there was a lot to keep us out of the apartment. Tattooing services were offered below our apartment. 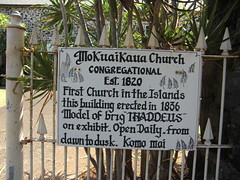 And the Islands' oldest church was next door. Walking around town, we occasionally saw a small weasels running around. 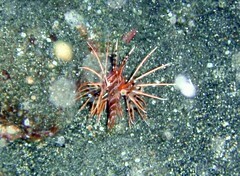 They are one of many invasive species on the islands. Regardless, they are cute. Our favorite meals were at a hole in the wall restaurant called Rappa Nui (which is the Polynesian name for Easter Island). Run by a New Zealand ex-pat and his American wife, they served delicious Asian fusion food with strong Indonesian and Malaysian influence. Really good nasi goreng! And the limited dessert menu was inventive; we liked white chocolate truffles with wasabi and coconut. It was fascinating how the island's climate varied from one area to the next. 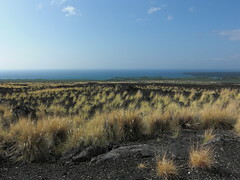 North of Kailua, there were lots of lava fields, like this one, with varying levels of vegetation, depending on when the lava had covered the land. There were also several world class beaches north of Kailua. Sigh. 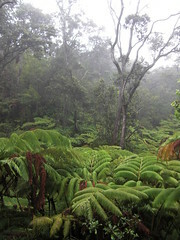 South of Kailua, the climate was jungle-like, with some of the world's best coffee plantations. This is where Kona coffee comes from. 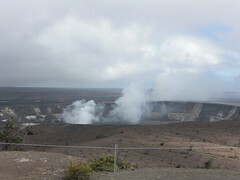 We drove through the verdant landscape to Kilauea Caldera, to see the famous volcano. Unfortunately, there was no lava that day. But the steaming crater was impressive nonetheless; you could feel its power. Hiking through the jungle near the crater, one trail went through areas that had recently been covered by lava. It was stunning to see the contrast between lush jungle and moonscape lava field — you could literally stand with a foot in both. 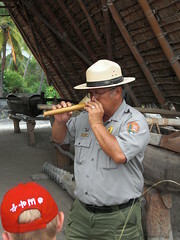 traditional Hawaiian nose flute. We loved his tour. 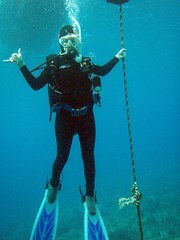 Diving off the Big Island was lovely. 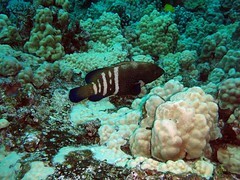 The waters are the calmest in the Hawaiian Islands, and it was nice not to deal with any chop. We saw some great underwater fauna, including a few nudibranches. 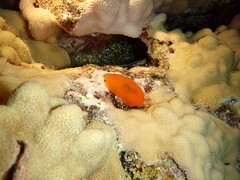 The fried egg nudibranch looks like its namesake. Orange gumdrop nudibranch was my favorite. A live conch about the size of my fist, had its pink mantle wrapped around the shell. Having only seen conch shells, I didn't recognize the live animal. 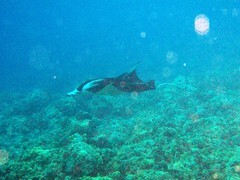 On a manta ray night dive, we hoped to see a herd of Volkswagen beetle sized manta rays gliding right above our heads. Unfortunately the mantas were elsewhere; at least we got to see one in the distance. The daytime dolphin swim was more successful. We swam with a pod of about 50 wild dolphins for an hour and a half. Snorkeling in the clear deep water, they surrounded us. At times there were 10 in a row, swimming many feet below us, or three off to the side, or a mother and baby at the surface. Their staticky calls and R2D2 yips filled the water. I swam hard to be next to 3 of them, and was beside them for most of the minute, before I had to catch my breath. They were close enough that I could see little nicks and scratches in their skin. We didn't bother with pictures that day. At one crowded public beach, we were immediately greeted by large green turtles, the minute we put our heads under water. Snorkeling in general was pretty great on the big Island. 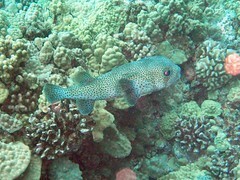 At another site we saw so many adult and baby puffer fish, several varieties of triggerfish, and many other fish. I spent the last day at a calm little beach in town. Perfect.